Would you pay this much to be the first owner of the track-tuned Camaro? Owning the first ever example of a car months before it goes on sale to the public must be satisfying, but how much would you pay for the privilege? In the case of the Chevrolet Camaro ZL1 1LE, someone paid $250,000 for the first completed model. Pricing has yet to be announced for the track-focused muscle car, but it seems unlikely that it will sell for anywhere near $250,000. The first owner of the ZL1 1LE happens to be Rick Hendrick, owner of Hendtrick Motorsport, who purchased the car at the most recent Barrett Jackson auction. The ZL1 1LE is the most track-capable Camaro yet – at least until the Z/28 comes along, that is. It packs the same 6.2-liter supercharged V8 found in the standard ZL1 which produces 650-horsepower, but has been fitted with a plethora of modifications tailored for the track. Among its track-tuned goodies include a carbon fiber rear wing, DSSV (Dynamic Suspension Spool Valve) dampers, Goodyear Eagle F1 Supercar 3R tires, and Brembo brakes. These tweaks allow the ZL1 1LE to blitz the Milford Road Course test track three seconds faster than the standard ZL1. While paying $250,000 for a track-tuned Camaro may seem foolhardy, it’s all going to a good cause. Money raised from the auction will be donated to The United Way, a charity that specializes in resolving community issues by working with schools, banks and government agencies among other organizations. 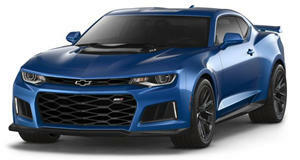 Regular customers will have to wait until later this year to get behind the wheel of the Chevrolet Camaro ZL1 1LE.